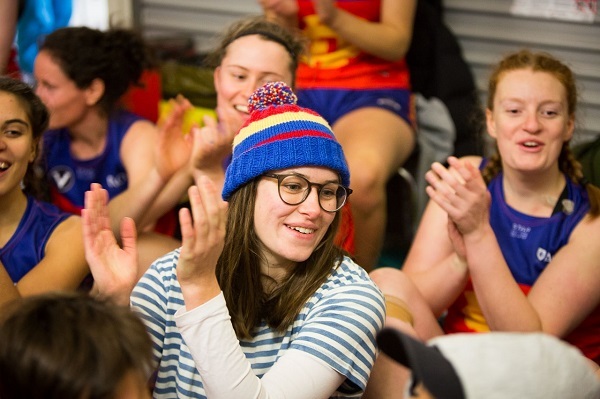 The Fitzroy-ACU Reserves Women left nothing on the deck when they went down by 23 points in the Premier Reserve Women’s Grand Final last Sunday, to a well-drilled and skilful Marcellin team, who had led the competition from the second week of the season. 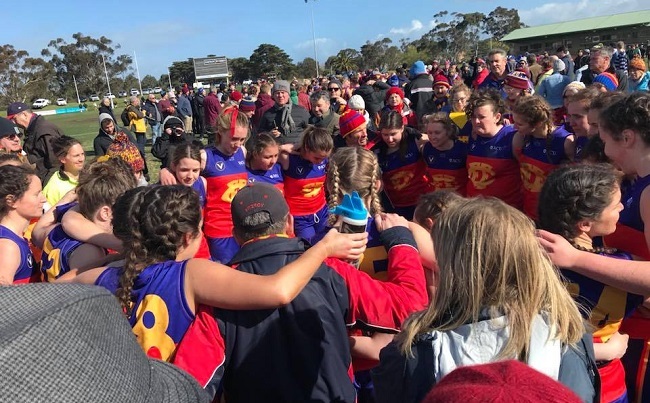 Despite the initial upset and disappointment at losing their first grand final, captain of the Fitzroy-ACU Reserves, Rachael Telfer, said the mood lifted pretty quickly because the team was so proud of themselves and each other for making it this far. Rachael said that the initial upset on the siren and the mental and physical struggle of the tough finals series were soon put behind them with messages from their coach Simon Jackson and the support of the huge Fitzroy crowd. “Jacko emphasised after the game that he couldn’t have asked for any more from us and he was proud of us so that was really great to hear. “Everyone was also buzzing from having the crowds that we had for our finals games! All the girls were so appreciative of all the supporters and players that came down to watch because we don’t often get people coming to watch our games, so it was really, really amazing having all those people there! That was definitely one of my highlights of playing finals this year,” Rachael said. There isn’t really a measuring stick long enough to show how much improvement has been generated by this team in 2018 and the superb showing in the finals, should only give them greater confidence going into 2019. In her first year as captain and with some unplanned time on the sidelines, Rachael said she could observe the improvements as they went. “I honestly can’t put into words how proud I am of the girls and how far we have come. We only won two games last year and then finished 4th and ended up in the grand final! 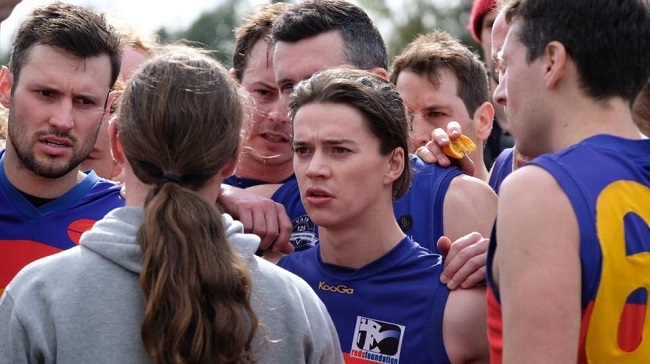 In his first year with Fitzroy-ACU, Jacko has made an impression. “Jacko has taught us so much and helped us immensely this year! I think the biggest thing he has taught us is to believe in ourselves and to take risks – not to worry about messing up or not pulling something off. “He constantly tells us that he believes in us and he doesn’t care if we mess up so long as he can tell we are giving 100 per cent effort and I think that gives us – and particularly the new girls that hadn’t played before this year – a lot of confidence going into games. “He’s also gotten very good at his pre-game rev up/motivational speeches and can pull out some pretty funny/lame things at training so on the whole the girls and I have really loved having him coach us this season. “As for next season; with a year of playing together and Jacko coaching us, I think our strengths will just keep building. Hopefully everyone from this season comes back and we get some more recruits (maybe even potentially a third team!). And hopefully we get a good new senior coach who fits in with Jacko and all the girls. “I’m glad to have a break but definitely already excited for next season,” Rachael said. Nice work Rachael and team. We’re excited about next season too. Back on the field, Emily Fitt played an outstanding game in the grand final and kicked both of the team’s goals under enormous pressure. Tess Young was best on ground, along with Fitt, Freya Shearer, Katie Hillier, Bridie Murphy and the captain. The final score was 5.9.39 to 2.4.16. If you missed the game or would like to watch it again, the VAFA filmed it and it’s is available here on VAFA TV. 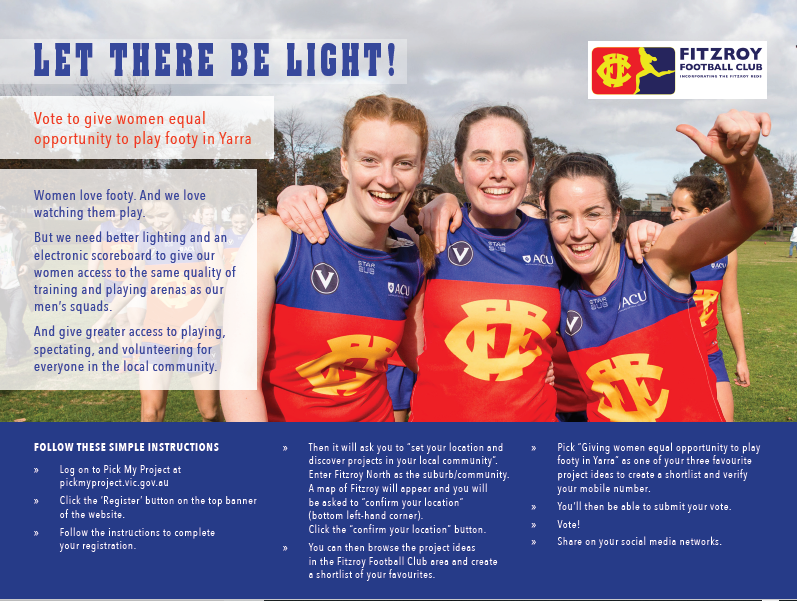 With the finals fast approaching, we’d like to remind all our Fitzroy players and supporters about the VAFA codes of behaviour and our expectations. It is very exciting to be heading towards senior and reserves men’s finals on the back of our wonderful finals campaigns by our Thirds men and Reserves Women - so it’s an important opportunity to remind everyone about expected behaviour at our games. Footy is an emotional game - that’s why we play it, watch it and support it. 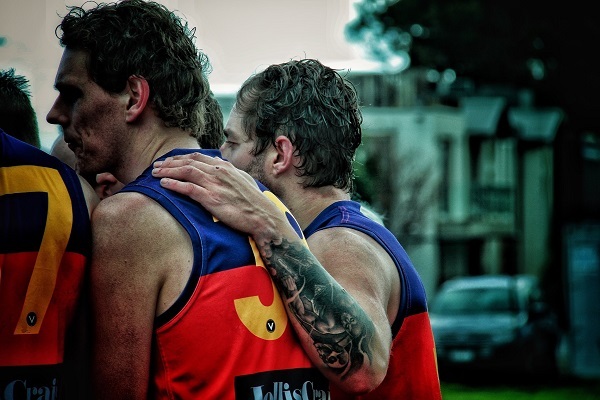 And Fitzroy supporters and players are as passionate as they come. We are also very proud and grateful for the consistent huge turnout of supporters at our games, which has been even bigger in our finals so far. 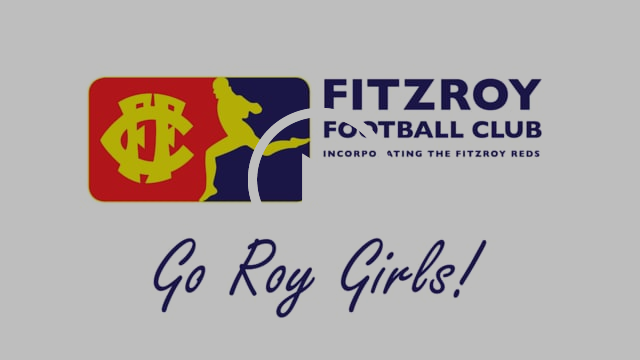 Fitzroy is a club that prides itself on its diversity and welcoming all into the fold; we do not tolerate behaviour at our games and around the club where playing or barracking and supporting our teams involves personally targeted abuse towards players, opposition teams/supporters or umpires. 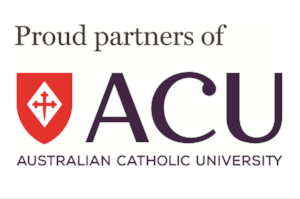 Any behaviour of an aggressive and intimidating manner, or that involves insults and call outs about a person’s gender, sexuality, ethnicity, race or faith is not on. This type of behaviour is also upsetting for many who have to witness it, not to mention those it is directed at. If you notice this sort of thing going on, come and find one of the club officials - we are always around, and we will respectfully but firmly respond to it. Remind your mates who are coming along to support the club what acceptable supporter behaviour looks like - and what it doesn’t. Please have a look at the VAFA Codes of Conduct that we all sign up to as players and members of a club that plays in this Association. Good humoured and intelligent bantering and barracking is part of the fabric of sport … but there is a line that is not to be crossed. Let’s all have a fabulous remainder of our season. 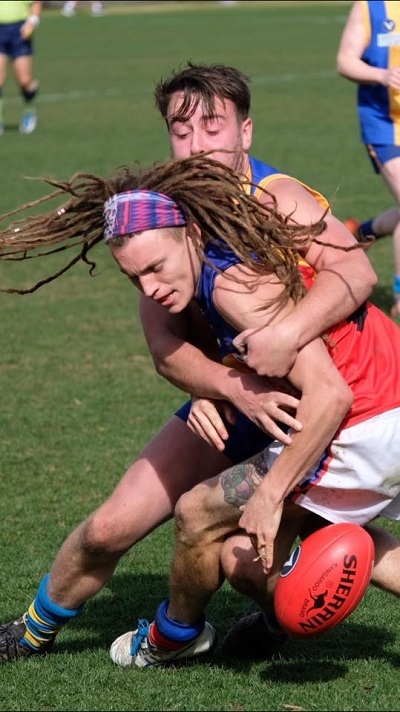 The Fitzroy Thirds have bowed out of the premiership race after a 7-point loss to De La Salle at Waverley Oval on Saturday morning. The team that lost four of its first five games this year before finding its mojo, had bounced into the finals with plenty of form and could well have knocked off the premiership favourites, with a bit more luck and structure in the forward line. But they could comfortably look each other in the eyes at the end of the game and know they’d given it their best shot. Credit to the De La Salle defence which withstood an enormous amount of pressure as Fitzroy played nearly the entire last quarter in attack. Playing the early game in conditions which showed no signs of what was to come later in the day, De La Salle made the early running and the sizeable Roy crowd which had made its way to East Malvern, was looking slightly concerned at quarter time (4.3.27 to 1.2.8) and even more grim as that margin got out to 5 goals mid-way through the second term. But a burst of three Fitzroy goals just before half time put them back in the game and only 11 points down. De La Salle kicked three goals to two in a dour third quarter and had slightly extended its lead to 13 points by the final break. The final term was an arm wrestle and despite having a lot of the ball, Fitzroy scored just 1.2 to De La’s two points. Fitzroy just ran out of time. Nathan Grimshaw (left) was the best player and had been excellent in the weeks prior too. Hugh Morris Dalton, Will Symons, Kai Menzies, Rhys Dolby and Bryce McAdam were among the best. The goals were shared with Will Symons, Liam Webb and the double and triple teamed Tim De Natris all kicking two. Coach Trent Coleman told the team he was truly proud of what they’d achieved, going one step further than last year. On reflection during the week he said there was true Roy spirit on display and highlighted many team achievements, including defeating the reigning premiers Williamstown three times and grand finalist Beaumaris at home. Trent made a point of thanking all 78 players who had pulled on the jumper for the Thirds throughout the year, particularly for their patience and understanding over some very tough selection nights. 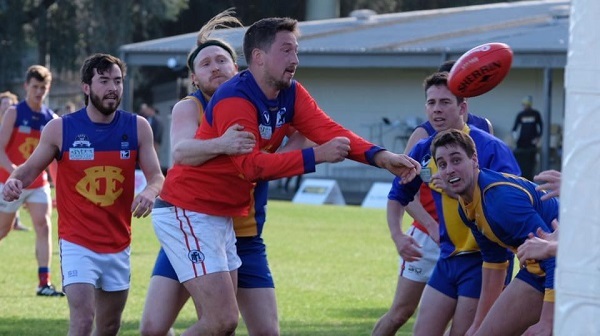 Just some relfection from one who has missed the ultimate glory, to all those playing in finals over the next few weeks… Sam Buckley lamented after the game that in 25 years of Fitzroy footy he hadn’t played in one grand final. When the coaches say the opportunities don’t come around all that often, it isn’t just an empty cliché. Williamstown CYMS has sealed top spot on the Premier C ladder with a convincing 22-point home ground win over Fitzroy last weekend. The Roy Boys will be left with plenty to think about and work on before the sides meet again in the first week of the finals. On reflection it may have been the first quarter that was the most instrumental in the final result. Despite Fitzroy going to the quarter time break in front, Williamstown had managed to score three goals against the wind; the best return of the day. On a day when Melbourne outdid herself with the weather shenanigans, the conditions had everything from bright sun to hail and howling winds. The home side knew the flukes of the conditions and the smaller ground and played it all well. Having said that, the Fitzroy boys worked incredibly hard and did their best to help the game live up to its top of the table clash billing. The start was very bright with Ted Clayton and Nino Lazzaro kicking two goals each in the first quarter. Williamstown’s ability to lock down in defence from there and limit the scoring to just two more goals for the day was what won the game. For all that, Fitzroy was only 8 points down at three quarter time. They really needed to be in front given the wind advantage…. Williamstown came home stronger kicking two goals to nil. The CYs looked composed and will take plenty of confidence from the game. Nathan Ligris played a strong game and continued to drive the ball from defence into attack whenever the opportunity arose. The backline worked hard with Tom O’Donnell and Max Ellis also named in the best players. Nino Lazzaro, Jack Dalton and James Butler were also praised for their efforts. The final score was 9.12.66 to 6.8.44. The Reserves game was a very similar story. The Fitzroy Reserves suffered a rare defeat at the hands of Williamstown after the home side kicked three goals to nil in the final quarter to win 6.18.56 to 3.16.34. 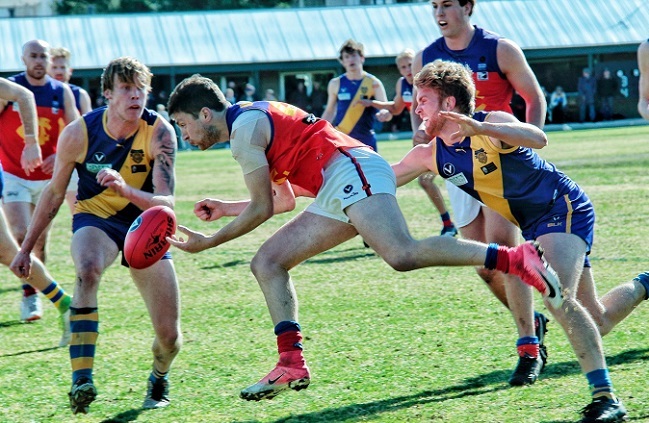 Fitzroy still maintains its top spot on the Premier C Reserves competition, but the gap is narrowing. The scores were tied at three quarter time, with 3.12 each telling the story of the goal kicking challenges on the day. Aaron Tatchell, James Graham and Nick Harrison kicked the goals on the day and Greg Burns, Sean Laidlaw and Max Davie played good games. There are some very big ins for tomorrow’s game as players attempt to prove their fitness and readiness for finals and the coaches look for the right mix. Having spent last week in the Reserves and coming back of long injury lay offs, Tom Biscaro and Toby Hudson Bevege stregthen Fitzroy's defensive stocks tomorrow, whilst up front Nathan Jumeau provides another strong target in front of goal. The surprise 'in' is Aiden Lambert who may have just the turn of pace out of the midfield that could make a difference to a game. He is bound to be a bit rusty but his return is an exciting prospect. Tomorrow is the final home game at Brunswick Street Oval and we’d love to have all our fans down there to cheer on the boys as they face PEGS, who inflicted our first defeat of the year earlier in the season. The weather will be fine, the BBQ will be running and the big raffle is drawn after the game. Join us for the day and Go Roys! Pick my project – have you voted yet? Following their final home and away game at Ramsden Street on Saturday, Under 19 Coach, Greg Coleman, told his team that he was stepping down from the role. 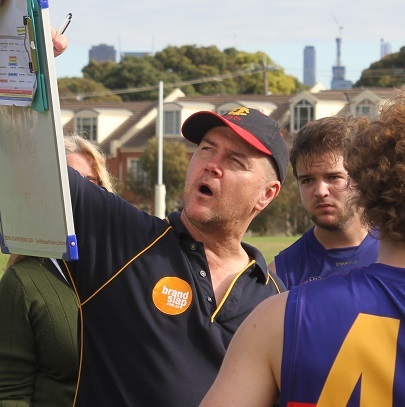 Greg stepped into the job vacated by Tim Bell this year and took on the sole Under 19s coaching role, having coached Fitzroy’s second Under 19 side last year. Prior to that Greg had an extended coaching career with the juniors. The Under 19s won five games this year in a very positive middle part of the season and continued to provide a rich source of talent for the Seniors and Reserves with players like Noah Wright and Sunny Brazier making an impact when they came up to the senior side. The Under 19s finished 8th on the VAFA's Under 19 Section 2 ladder and went down to the Parkdale Vultures 9.16.70 to 2.4.16. The club will soon advertise for the Senior Women’s and Under 19s coaches and wishes to thank Greg for his work with the Under 19 sides for the last two seasons. There's still time to buy your tickets for this year's Fitzroy Major Raffle and support your favourite footy club. Tomorrow is your final opportunity to be in the running for double-passes to the 2018 Toyota AFL Finals series tickets (donated by the Brisbane Lions AFC: AFL Authorised GF Promotion Code GFAFL 18/17), including the 2018 Grand Final. Tickets will be sold at tomorrow’s game. Just ask one of the officials to point Helen Manoli out to you. So support your favourite footy club today...Go Roys! The raffle will be drawn after the game in the post-match function. Everyone is welcome but don't worry if you can't be there on the day, as the Club will contact you directly if you have won one of our fabulous prizes. 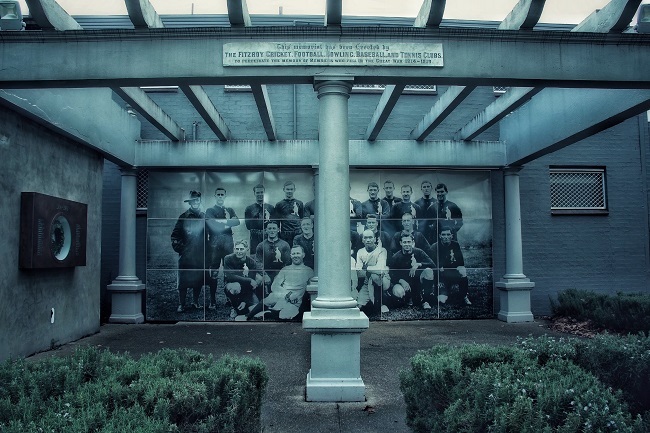 Members of the public and the club are invited to the dedication of the beautifully upgraded Sportsman’s War Memorial at Edinburgh Gardens on Sunday 9 September from 2-4pm. The Mayor, Councillor Daniel Nguyen, and Councillors of the City of Yarra will join members of the public to pay recognition to the importance of the memorial. The Sportsman's War Memorial was erected in memory of members of the local sporting clubs who died in the First World War. To further highlight the position and significance of the Memorial, some interpretive and enhancement works have now been completed. The memorial was funded and erected by the Fitzroy cricket, football, tennis, baseball and bowling clubs and the City of Yarra has undertaken the works. BBQ queen Kerry Winchester will be working so that guests can have a sausage sizzle as part of the day. Last year it was Max Ellis and Tash Ross-Harris who took senior honours on Redlow night. To be at Fitzroy’s night of nights for the announcement of the best and fairest winners in all six teams, book your ticket for Redlow 2018 on Friday 5 October. 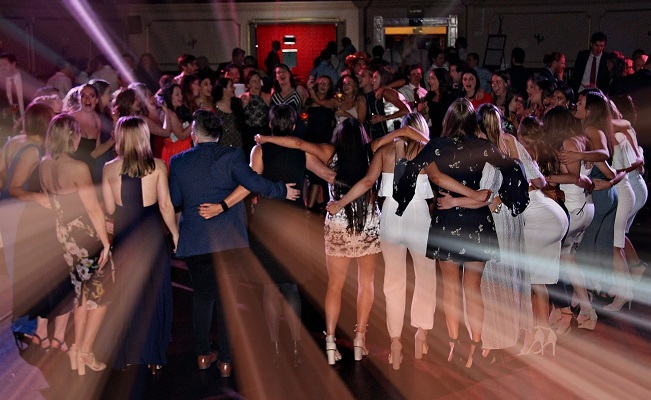 The club will again celebrate its season at the Regal Ballroom in Northcote and with four teams making finals, the competition for bragging rights will be hot. Bookings are open now and will close on Thursday 20 September. You can book individually or any number up to 10 tickets. There are 10 seats to a table.